The temporalis muscle arises alongside the temporal lines of the parietal bone of the skull and it is a fan-shaped muscle. The muscle is located inside the temporal fossa. A robust fibrous aponuerotic sheath known as the temporalis fascia encloses it and travels medial towards the zygomatic arch. Entire floor of temporal fossa, with the exception of the portion created through the zygomatic bone. Deep surface belonging to the temporal fascia. The medial surface, apex, and anterior margin of the coronoid process of ramus of mandible. The anterior margin of the ramus of mandible, nearly till the last molar tooth. The most posterior fibres are set nearly horizontally. Intervening intermediate fibres are set obliquely. The muscle thickness differs from 5 mm alongside its periphery to 15 mm at the zygomatic arch plane. The general area of muscle is 10 cm in width and 20 cm in length. The temporalis muscle is enclosed through a thick, tough fascia known as the deep temporalis fascia that is constant with the periosteum of the skull. A few fibers of the temporalis muscle originate via this fascia. 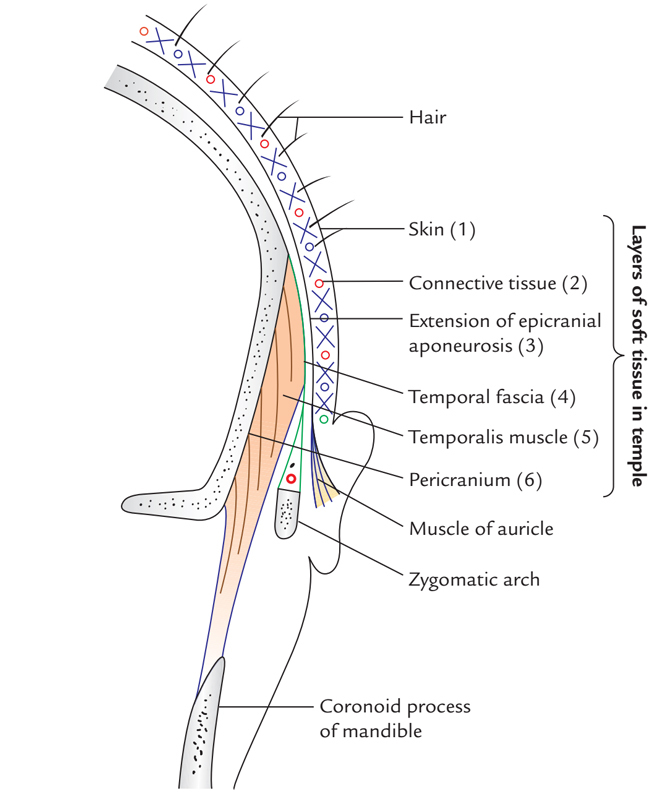 The deep temporalis fascia divides within superficial and deep layers which afterwards attach within the superficial as well as deep parts of the superior part of the zygomatic arch, on the temporal line of fusion, a few centimeters superior towards the zygomatic arch. In the middle of these two layers a wedge-shaped, superficial temporal fat pad is located on the superior surface of the zygomatic arch. Middle (deep) temporal artery is a branch of superficial temporal artery that travels on the temporal fossa deep towards temporalis muscle and circulates the temporalis muscle and fascia. The temporal region is the zone lateral towards the skull in the middle of the temporal line and zygomatic arch. It is the location where the temporalis muscle attaches. Temporalis is attached to the ramus of mandible and it is inserted at the coronoid process on its apex, anterior margin, as well as inner surface. The major muscles present in the infratemporal fossa are – Lateral pterygoid, medial pterygoid, and tendon of temporalis. Lateral pterygoid muscle is superficially related to Tendon of temporalis. Deep temporal arteries which are usually two in number are branches of maxillary artery; rise up on the lateral aspect of the skull deep to the temporalis muscle, which they supply. Deep temporal nerves which are branches of mandibular nerve usually are found two in number, anterior and posterior. The anterior and posterior temporal nerves in order to supply the temporalis muscle from its deep aspect emerge at the upper margin of the lateral pterygoid and rise up in the temporal fossa. The anterior and posterior deep temporal nerves supply the temporalis muscle. The temporalis muscle raises the mandible and so seals the mouth and brings the teeth closer to each other. This movement needs the perpendicular pull of the anterior fibres as well as posterior pull of the posterior fibres. Posterior fibres withdraw the mandible afterwards its protrusion. The muscles of chewing and their motor nerve supply can be examined clinically via clasping the teeth constantly and afterwards examining the temporalis and masseter in the temporal fossa and superior to the ramus of mandible, correspondingly. Diffuse facial pain – spasm of masseter muscle. Headache – spasm of temporalis muscle. Jaw pain – spasm of lateral pterygoid. Symptoms in the joint may be related to clicking and pain. The clicking is frequently audible while the patient is chewing. It arises whenever the posterior connection of the disc becomes strained or separated, making the disc momentarily or permanently confined in anterior portion. The instability of articular disc emerges via an overclosure or malocclusion.